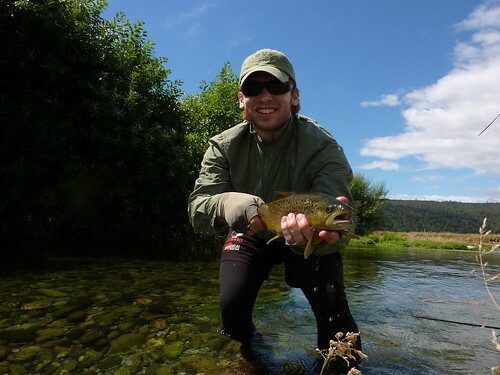 Home » Fly Fishing » What a Fine Month! My blog should have been updated around a week ago but my internet conspired to prevent me doing so but finally it has been fixed! January followed on from the fantastic trip at New Year and did not disappoint. I spent the first week and a half of January walking the Abel Tasman coastal track once again with a few friends, then stayed with a family in Golden Bay before travelling and fishing my way down the West Coast and into Fiordland National Park. I’m afraid to say that’s the closest hints to locations I’ll be giving away – you know the policies on that! 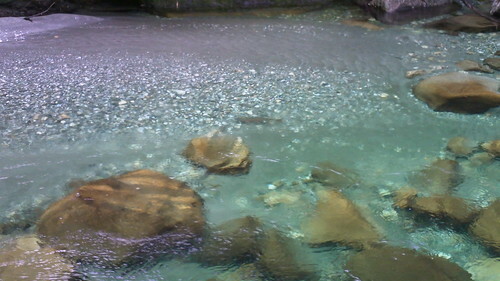 First on the agenda was a lovely little spring creek for a day in which everything was just perfect. There was no wind, not a cloud in the sky and roasting hot temperatures – a wonderful day to be out. The fishing was hard though. I imagine this particular creek gets a bit of fishing pressure as a few of the fish seemed rather wise, they didn’t spook but were content to ignore everything I offered them. These pictures should give you an idea of just how wonderful this wee creek was. After the frustrations of those few fish that weren’t for playing ball I managed to hit it right and started getting in amongst the fish. The first of these was a spritely 2lber that nailed my dry. A lovely fish! With the first fish on the bank and the blank shaken off I was soon into my second fish of the day – a truly magnificent brown but not for the usual reasons. This rather interesting specimen had almost no spots on his flanks, just one sole spot behind his gill plate. This fish was the culmination of a year or two’s hard work to gain special powers. 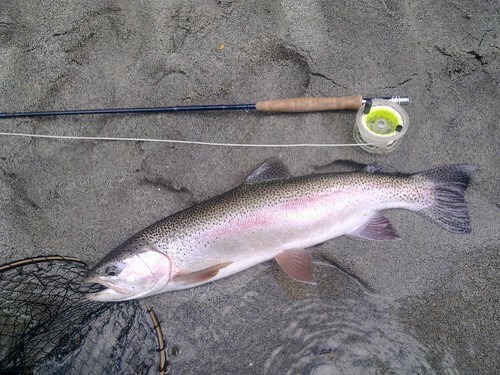 It has been noted on the Wild Fishing Forum that a spotless trout is the true bearer of special powers. As you will find out later, I tend to agree. 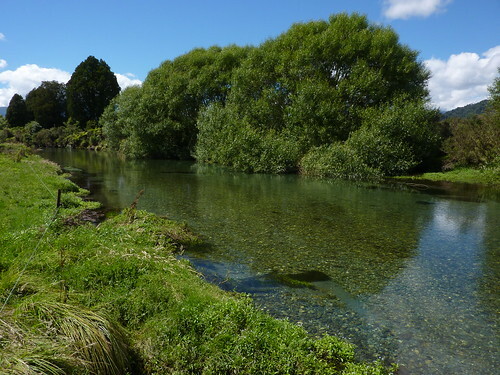 The rest of the day ended up with 2 fish hooked and lost, surprisingly large fish for a wee creek – I’ll be back for sure! So…Fiordland. The culmination of months of planning and dreaming. The trip was 8 days, the distance covered was almost 200km on foot, many flies were lost, many cold mountain days and many hard times were had; but the fishing was out of this world! Night one was just a couple hours on a river I have fished before, the plan was to go and find another old friend that has beaten me once. To my delight I found him cruising his back eddy exactly the same as before. I wasn’t going to make the same mistake as last time so I sat and watched for 20 minutes, slowly creeping into a casting position – seated in the middle of a bush. Finally it was time, I cast the fly a few metres in front of him, he cruised over, opened his jaws and clamped them around the dry. Nailed him! An absolutely gorgeous fish of 5lb and probably the most satisfying trout I have ever caught. The length of time taken to make the perfect cast and to get him this time around was simply magical. I have a video of this fish and will update once I upload it! Day two and the start of real McCoy of the January trip. This trip continued with the A-team theme from the previous report rather well although this time I played a multitude of characters. I started playing my role as face man to find alternative means of transport. 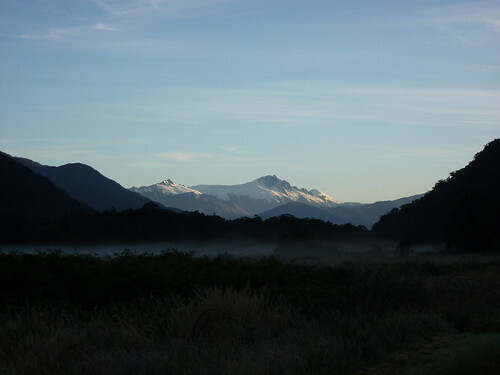 One issue with Fiordland is that it is full of 1000-2000m mountains and lots of water. Boats can be useful. So a bit of poking around and arranging deals here and there and I had transport acquired. All my gear was loaded onto the boat and I was off, 7 days solo in some of the most remote I have been in. That fish broke me off on 6.9lb tippet…..he ran upstream and around a massive boulder! One of 4 fish broken off on the trip and one of at least 11 or 12 fish hooked and lost. The largest fish tipped the scales at 7lb. Unfortunately my camera was dropped in the river and my waterproof camera ran out of battery so I only have phone pictures! It was in magnificent condition and fought like a devil. 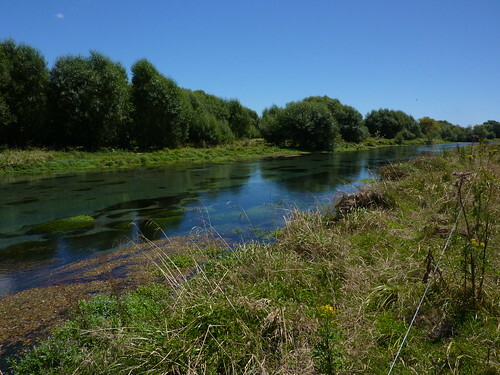 I had spectacular fishing taking trout on dries, nymphs and streamers. They were the hardest fighting fish I have ever witnessed and the surroundings were absolutely amazing. I would love to post pictures of what I got to see but in the interests of protecting such a wonderful place I won’t be posting them. At one stage on this trip I lost 4 fish in a row pushing my confidence right to the limit before managing a 5lb then a 7lb rainbow. I truly was defeated by those four fish but the successes more than made up for the huge number of losses. Access was incredibly difficult, native bush is so dense and the riverbeds are stacked full of huge boulders. A bit of perseverence gets you some amazing things though! 1) Fish are not too fussy about increased tippet diameter but they are about kinks and tippet above the water. 2) Dragging flies spook fish, especially nymphs. 4) If you miss a strike, change fly and recast. It works! 6) For cruising fish – wait, wait and wait some more. Only cast when absolutely sure of perfection. 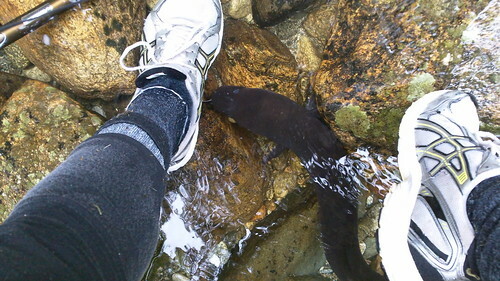 I saw more large fish than I have ever seen and saw more large eels than I have ever seen. One even came to say hello! You can see a lot more of the photos on my flickr page: Click Me! 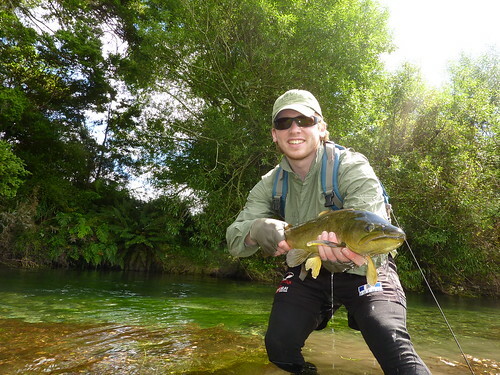 That really capped my New Zealand fishing so far – it was the greatest fishing experience I have ever had, a truly unbelievable trip. I can’t wait to access more of the area! This weekend just passed saw me drive to Middlemarch for the FFF Southern Conclave. It was a great event with loads of great prizes and great people. I met a lot of people I have spoken to via email which was great and met a lot of new people too. Lots of fishing plans have been laid, I just need to find the time to meet up with everyone again! Alex and Fred from the Wild Fishing Forum are arriving here in a few days time and I’ll be heading to join them for some fishing. Three Scottish guys on the river, those trout are in trouble! Awesome Jack! Certainly did manage a fair haul of stuff – still really happy! haha. That camouflage gear is exceptional to say the least! I’ll be up for a fish soon, I broke my foot on Sat night though which might slow me down, but only for a short while! How was the wee rod with a fish on? I’ll look you up on facebook btw, be easier to keep in touch!